Having trouble keeping track of the action in your favorite RPs? No problem! 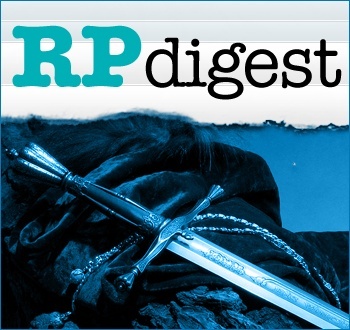 Our weekly RP Digest will keep you in the loop. This adventure has just begun, and for that reason not much has happened, but surely many adventures will take place. Our heroes started off on their own paths, some were knights looking for work, and others were modest men looking to help others. A cold wind blew through the city as Arthur Winsler put up posters; his father was deathly ill and wanted to see an old family heirloom before he passed. This is what would bring our heroes together for the first time and will probably keep them together for many trials and tribulations to come. Then he got attacked by a dragon, was saved by a Japanese 300 year-old teenage dragon slayer, met a tights-wearing Superhero Pornstar, met Death's kid and his cousin, was joined by Dark Link and Frohman, was sent back in time by a bored Locust general, fought some Nazis in colonial time with George Washington, then was sent back by a pissed off Star Dragon, and just finished fighting some religious nuts in brightly colored spandex and a Voltron (which they burned). ...The happy Ram wonders what else can happen in a day of an Avatar Adventurer. Anyway, we're now fighting some robots from a Dr.Wiley in a volcano to get to that Sovorgoth, Sevorgeth, Seveorg....that one sword o' power. As the fierce battle between Dalji and Debatra finally comes to a close, a less-than clever tactic used by Dalji sends the Knight's Court Inn to pieces. Now that the blockade is down, Tronfros feels free to end the fight, and so does a vengeful Raz'nak. Arrived on the newly-colonized planet, Archon, approximately six hours ago. A small, outlying settlement has sent a transmission to the planetary governor asking for a squad of local militia to be dispatched in order to help quell an uprising of the settlement's indentured servants. I have been sent in as an "observer" to supervise the squad and complete my own investigation into the incident. As I record this, we have just arrived in Aberdale. From what we've uncovered, there are no people to be found. We are currently making our way to the settlement Overseer's building to uncover more information.